Once upon a time on Tom Sawyer's Island, there was a burning cabin that had [in storyline] been attacked by Native Americans, which created quite a dramatic scene as guests sailed by it on board the Mark Twain or S.S. Columbia. Over time, though, either for safety or politically correct reasons, the cabin's flames were extinguished, and it simply became a frontier abode. With the reopening of the Rivers of America, this cabin has a new and slightly modified role as the cabin of one Mike Fink. Longtime Disneyland fans will recognize the name from the keel boats that once briefly plied the waters of the Rivers of America. It's a nice gesture to re-purpose the cabin into the legendary riverboater's home. And it's a pretty scene on the island for guests to sail by! 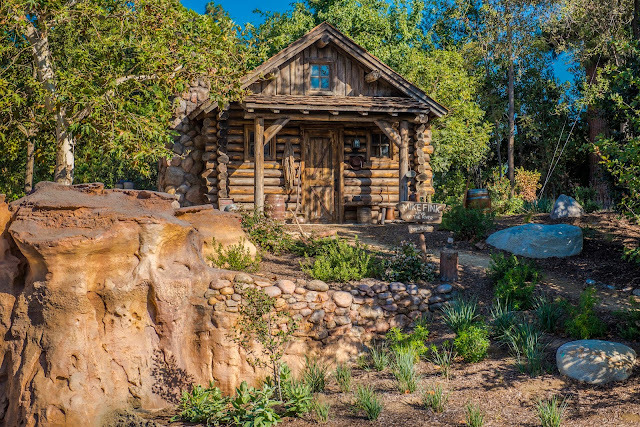 The old burning cabin on Tom Sawyer Island is now Mike Fink's Cabin.